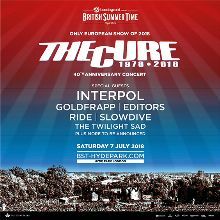 THE CURE will be celebrating 40 imaginary years on Saturday 7th July 2018 with a 120min headline show at BST Hyde Park, London. Tickets on sale 9am Friday 15th December 2017. Presale is 9am TODAY 12th December. Tickets on sale 9am Friday 15th December 2017. Presale is 9am TODAY Tuesday 12th December. - the password is IMAGINARY. The Cure have announced details of their only European show of 2018 – with a special 40th anniversary celebration gig at London’s Hyde Park as part of British Summer Time festival. Robert Smith and co will be joined by special guests – including the return of Interpol, along with Goldfrapp, Editors, Ride, Slowdive, and The Twilight Sad. Great! I've just placed my ticket order. Who? Never heard of Interpol, Editors etc. either! yeah!!!!! I have my tickets!!! What opener song for the 40th Anniversary concert? What exactly "Entry for Primary Entry and General Admission customers into this area is on a first-come-first served basis and it is not guaranteed" means? it's kind unfair because if we paid like you said 10£ more we should have right to go there if not whats ythe point of paying more?!? Wow, great news, thanks for sharing! Goldfrapp, Slowdive!!! Amazing line up! What wonderful breaking news!